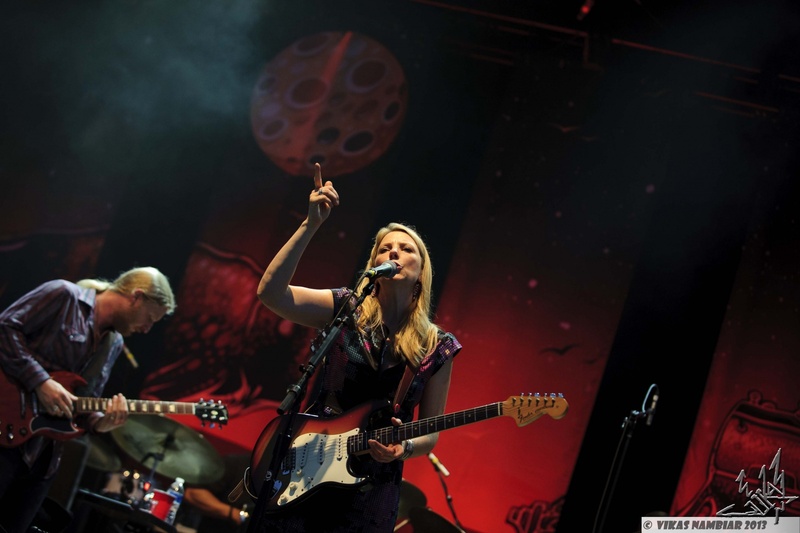 Once again our gracious correspondent Stuart Raper checks in with an update from Tedeschi Trucks Band's tour of Europe. Join us next time as he gives a full report from the legendary Montreux Jazz Festival... Vienne, France embodies all of the wonderful things you've ever heard said about the south of France. It's stunningly beautiful with architectural relics scattered about and friendly people enjoying each other into the wee hours. This time of year, music abounds on every corner, filling the rustic alleyways with songs from Vienne's finest local players. As TTB arrived for sound check, everyone present was taken by the ancient beauty of Theatre De Antique, with its stone levels built into the hillside, wonderful sound, and breathtaking views from its top. Not to mention the fact that it has hosted some of the world's greatest musicians. A stone passageway backstage is adorned with tributes to Miles Davis, celebrating the many performances he gave in Vienne over the years. Derek strolled down the stone corridor gazing at the images of one of his heroes. It seems as though it would be impossible for any musician of this caliber to not be inspired by such a setting. You could tell by the end of sound check that this would be a special night. But before the show even began, TTB's own Kebbi Williams was already making his rounds. I strolled through the cobblestone streets of Vienne with Kebbi and his saxophone, watching him sit in and jam with every band along the way, much to the delight of locals. It was performance in one of its most natural forms, playing for nothing but pure enjoyment. Music was in the air in the truest of spirits. The band came out blazing with the soulful groove of “Bound for Glory,” which proved the perfect fit to give the Vienne crowd their first taste of TTB. They followed with "Midnight In Harlem," filling the ancient coliseum with its poignant beauty. "Love Has Something Else To Say" was a hit tonight, and I couldn't help but grin as I watched Susan's rhinestone bedazzled high-heel work her wah-wah pedal with graceful funkiness. Mike Mattison stepped up front to duet "Anyday" with Susan which then evolved into an Allman Bros "Blue Sky" jam for a second before stepping right back into the chorus. I was incredibly excited next, when I heard "Until You Remember." This was personally my first time hearing this song live, and I wondered how they'd pull it off without a full grand piano, like they have on the album. But once again Kofi Burbridge never ceases to amaze me, playing the organ part on one hand and piano on the other, seamlessly as always. I've found this song to be so powerful and hearing it in such an amazing setting was one for the ages. Oteil Burbridge shined on bass and vocals as they busted out Hendrix's "Manic Depression" which then morphed into an Oteil, Derek, JJ Johnson, and Tyler “Falcon” Greenwell jam, taking on new forms that would have made even the man who wrote it proud. Stevie Wonder's "Uptight" did the same thing in its performance this evening. It started out as a motown rocker but then found its way into some new territory. JJ and Falcon were playing so hard their drumsticks were spewing splinters and I was impressed their kits could stand so much power. Those two are incredible players individually, but put together, they are a true force to be reckoned with. But the same can be said for every member of this band. The chemistry and delivery of each song grows more each gig, never sounding quite the same, but always achieving the same goal. They closed out the set with "I've Got A Feeling" a beautiful rocker to close out a wonderful performance. Stay tuned as we continue to revelate overseas!